Sunday is my cooking day, more so in the fall and winter than in the warm months, but even in the summer it’s a good day to prep food for the week. I usually bake something, make a few salads, and prepare a soup or ragú. Tonight Chuck is leaving for New York, and when he returns we will be going away for a few days, so I need to restrain myself from cooking too much. 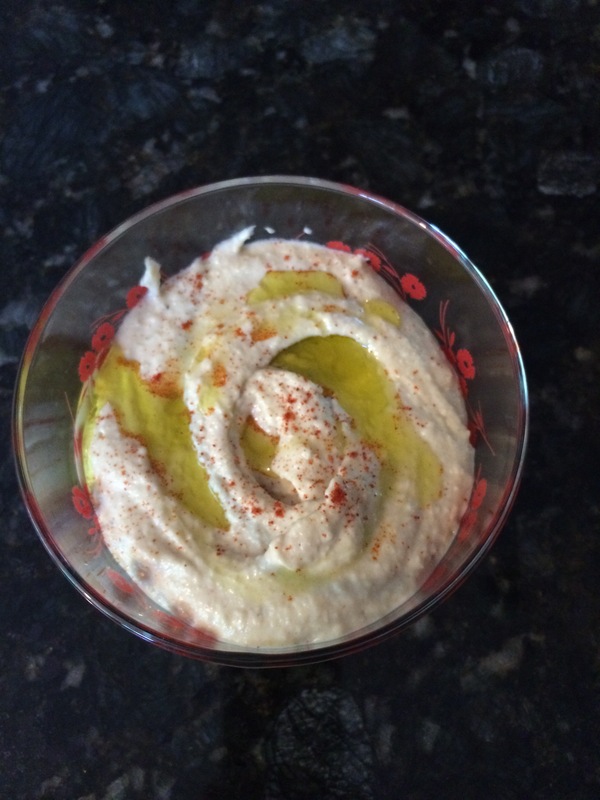 I made hummus yesterday, having soaked the chickpeas all week, and I started it with tahini paste that I made from scratch. Sadly it was a bust – the flavors were off. I’m sorry to say that I threw out the batch and started again today, with store-bought tahini and canned chickpeas. I use a fair amount of garlic and a lot of lemon juice. I will happily eat this all week. Barb brought me all her ripe zucchini before going on vacation, and asked me to make double-chocolate zucchini muffins to share when she returns. We have a good co-operative system going – she brings me ingredients, and I prepare goodies for us both. We go through a lot of pesto in this way. I will bake the muffins, but I fear that will only use up one zucchini, so I will make a zucchini-carrot kugel and freeze it, and some kind of zucchini slaw (with apples and shredded brussels sprouts, I think). Cochon in New Orleans serves a ribbon squash salad with goat cheese and toasted pecans that is better than it sounds, and even better than it should be. The flavors combine and boost each other up into salad heaven. Even people who don’t like summer squash or zucchini have enjoyed it. Maybe I’ll make that too. 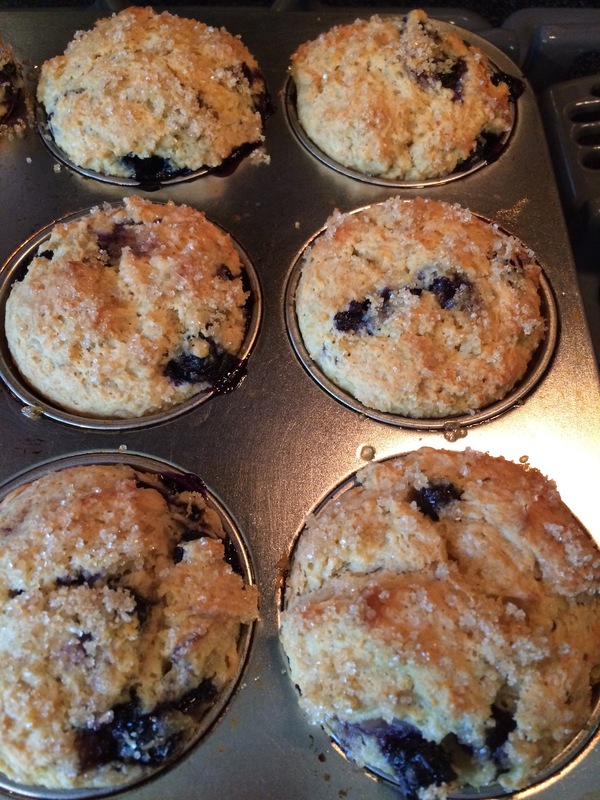 In the most recent Barrington Times there is a recipe for Blueberry Ricotta Muffins. It sounded good, and one woman in my office said she would eat them if I made them. This is a big deal for me, since I am curvy woman who loves to eat surrounded by thin people who hold back. I made a few changes to the recipe (as I usually do). They are moist and flavorful. Preheat oven to 350. Mix together turbinado sugar and 1 teaspoon of the lemon zest, and set aside for topping. Whisk together eggs and cheese until completely combined, then mix in melted butter, lemon juice, remaining lemon zest, and granulated sugar. In a separate bowl, mix together dry ingredients, then add all at once to cheese mixture. Mix gently until mostly combined – doesn’t have to ball complete and shouldn’t be over mixed. Add blueberries, and stir just to combine. I use an ice cream scoop to measure out portions of the batter into a greased or lined muffin tin. Sprinkle reserved lemon-sugar on top, then bake for about 30 minutes. Check with a toothpick for doneness. Remove from oven, and let cool in the pan for 15 minutes. Carefully remove muffins to a plate, basket, or cooling rack. During the warm months, on the sunny days, I change into a swimsuit and dash to Barrington Beach after work. Barrington Beach has come a long way since my children were little. I would let the kids paddle but not expose any mucus membranes to the water. 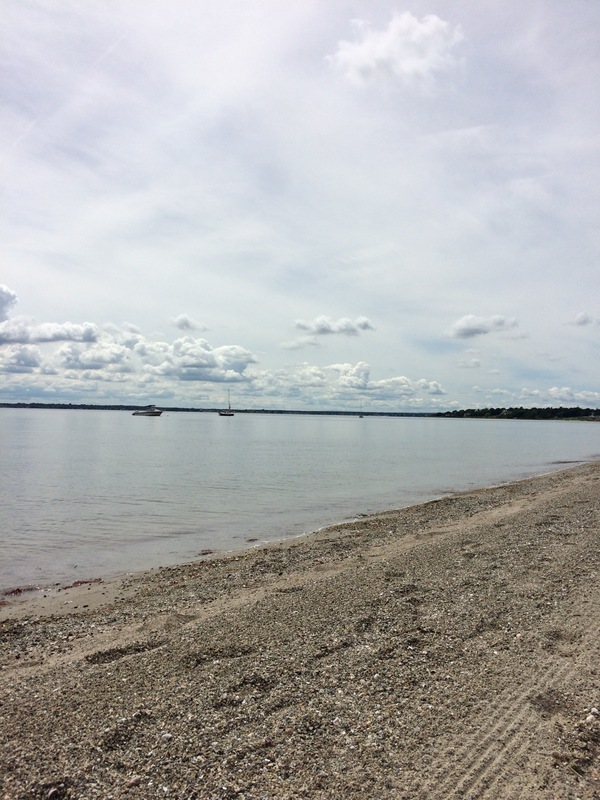 Then a few years ago the City of East Providence replaced their sewage treatment plant, and now the water of Narragansett Bay at Barrington Beach is lovely, clean, and clear. There is no red tide, unlike at Newport Beaches, and unlike those lovely white sand spots, at Barrington I can be sitting in my beach chair 10 minutes after leaving my desk chair. My friend Barb joins me at the beach most days, and those are the best. We chat, we swim, we snack, we sip. We get a lot of sun and have a lot of laughs and a few shared secrets. When I’m there by myself, I swim, dry off, warm up in the sun, and go home. Still nice, but not as good. When Chuck is traveling, I feel a little bit guilty leaving Luna the Shepherd-Poodle home alone while I’m swimming and sunning, so I dash home and take her for a walk. When Chuck is home, I feel a little bit guilty that I’m playing in the water and sun while he’s working, so I dash home and make dinner. Tonight I made lemon chicken, brown rice, and roasted zucchini. My lemon chicken is adapted from Babs Deacon’s recipe, which is outstanding. Mine is good too, although I’m a bit more haphazard about it. Sometimes I add mushrooms. Tonight I used dry vermouth instead of wine. It’s very forgiving. Mix flour and seasonings. Dredge chicken, then set aside. Heat heavy saute pan over medium heat, then add enough olive oil to cover the bottom. Add onion, then saute until translucent. Remove from pan, then top off the olive oil to again cover the bottom of the pan. Place a few dredged pieces of chicken in the pan, without crowding. Leave untouched until golden brown on the bottom (about 6 minutes? ), then turn over. Cook until browned, then remove to a plate. Cook all the chicken this way, adding a bit more olive oil as needed, removing chicken when browned. Without lowering the heat, pour wine into pan and scrape up any browned bits, whisking well. Add lemon juice, stock, and chicken base, whisking well. Reduce heat a bit, and let the mixture cook down until about 1/3 – 1/2 reduced. Turn off the heat, and add a few tablespoons of cold butter, whisking well. Then return pan to a low heat, add the onions and chicken back in, and simmer for a few minutes. Serve over rice, noodles, or mashed potatoes. My son’s experience yesterday in Baton Rouge, and thoughts following. The militarization of our local police departments terrifies me. I don’t tend to post long statuses, but I find it hard to stay silent after what I saw in Baton Rouge. This post is intended to urge white people (myself included) to participate more fully in the movement against racism on all levels. I do hope you take the time to read this. Yesterday, I saw dozens of police officers clad in riot gear and armed with assault rifles violently suppress a nonviolent protest calling for police accountability, peace, and justice in Baton Rouge. Despite the fact that the protestors were acting within their constitutional rights to assemble peacefully, the police arbitrarily determined that it was no longer a peaceful protest and forcibly removed people from the sidewalks and even from the home of someone kind enough to open her space to the demonstration. The police treated the protestors like they were violent criminals ready to riot when in actuality, the only thing that threatened violence was the militarized and aggressive police force. It is this kind of confrontation, out in the open, that makes it so clear to me that the police (and I don’t necessarily mean individual officers, but rather the overall nature, culture, and function of modern American police) really does not protect and serve the American people so much as the status quo – which means, of course, that it protects and serves white people’s interests over the interests of black people. This is such an obvious and visceral fact to any person of color, but as a white person, it’s easy to avoid. I never even faced the threat of police brutality until I participated in this protest, and even then, I was significantly less a target than any black person was and I would have been subject to significantly less violence. Moreover, as a white person, this conflict could have been entirely out of sight and mind had I just stayed home and chosen not to think about it. For black America, there is no such choice. I have also been reflecting on the nature of organized oppression and racism in America today and how it is not confined to police brutality, let alone such obvious confrontations with the police. Racism is supported by our criminal justice system, our educational systems, our health care systems, local housing policies, corporate hiring procedures, macroeconomic policies, and individual consumer decisions, to name just a few. In general, there are endless opportunities to confront racism in American society. And for white America, it is just as easy to avoid these confrontations in everyday life as it is to stay at home from a protest. So white people, let’s not “stay home” – let’s confront the ways that racism impacts our interpersonal relationships, our workplaces, and our communities. Let’s support local leadership and vote to bring about change. Let’s focus on transforming the systems of oppression in a constructive and lasting way. Perhaps most importantly, let’s address and correct the ways in which our actions (or inaction) serve to uphold systems of racism. If we struggle to find any such opportunities, we aren’t looking hard enough. I also write this in the hopes that you all will hold me accountable to do the same. I leave you with this: as many leaders have said before, we cannot fully be free until we liberate ourselves from the role of the oppressor and inextricably tie our freedom to that of the oppressed. We arrived late last night from our 11-day trains, planes, & automobile adventure. Like everyone I know, my heart is hurting from the week’s murders – isn’t it insane to say “this week’s murders?” We unpacked, did a little laundry, bought a few groceries, washed the dog – in short, we eased back into our home lives. There is a constant background buzz of sadness. In addition, our son is bringing a group to Baton Rouge to engage in peaceful protest of the murder of Alton Sterling. We are holding him, all the protesters, indeed all of us in the Light. 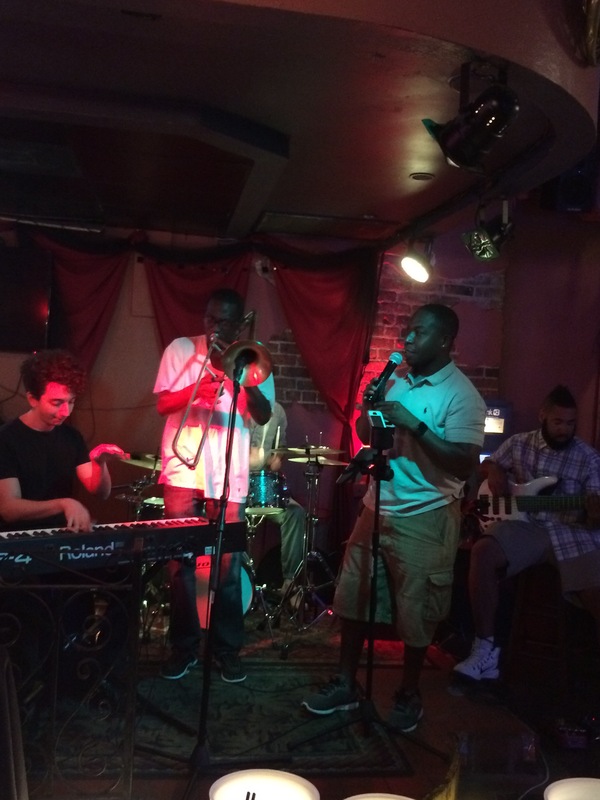 The photo below is my son with some of his band-mates from a gig on Wednesday night. Comfort food is in order. I made cranberry-topped meatloaf and roasted cabbage. Recipes to follow. We will drink a Cantina Zaccagnini Montepulciano d’Abbruzzo with it. Mix it all well but briefly in a stand mixer or by hand. Shape as desired (I bake mine in a 2 quart baking dish) then coat with Trappist Cranberry Conserve (or other cranberry sauce). Bake at 350 for about an hour. Cut a green or red cabbage in quarters. Cut out the core, then cut into wedges or slices, about an inch thick. Place on a foil-lined baking sheet, then drizzle with olive oil. Sprinkle with kosher salt, fresh-ground black pepper, and smoked paprika. Bake at 400 for about 20 minutes, then turn over and back for another 10 or until desired doneness. I like it to be slightly charred on the edges.